Department of Biochemistry, The University of Oxford, UK. Department of Biochemistry, The University of Oxford, UK.Technion, Haifa, Israel. Janelia Research Campus, Virginia, USA. Department of Biochemistry, The University of Oxford, UK.MRC Laboratory for Molecular Cell Biology, University College, London, UK. In brief We have discovered that a novel mechanism of regulated mRNA stability produces an expression peak of Prospero, the conserved transcriptional regulator that stops neural stem cells dividing during brain development. Syncrip, a conserved mRNA-binding protein, stabilises a cell-type-specific isoform of prospero mRNA containing an unusually long 3’ UTR. 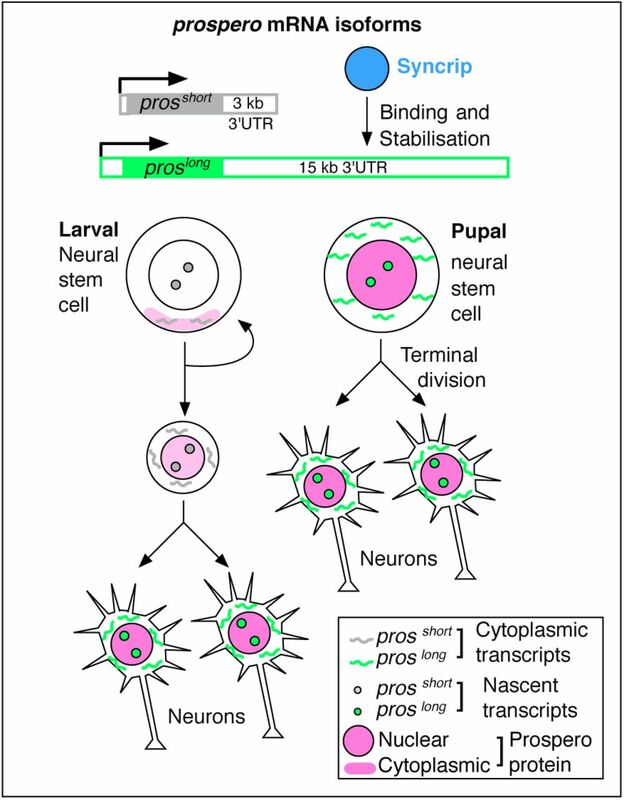 Summary During Drosophila and vertebrate brain development, termination of neural stem cell (neuroblast) proliferation and their differentiation require the conserved transcription factor Prospero/Prox1. It is not known how the level of Prospero is regulated to produce an expression peak in pupal neuroblasts, which terminates proliferation. Here, we use single molecule fluorescent in situ hybridisation to show that larval neurons and terminal pupal neuroblasts selectively transcribe a long prospero isoform containing a 15 kb 3’ UTR stabilised by binding to the conserved RNA-binding protein Syncrip/hnRNPQ. The long prospero isoform and Syncrip are both required to stop neuroblasts dividing. Our results demonstrate an unexpected function for mRNA stability in limiting neuroblast proliferation required for normal brain development. Given that Prox1 regulates vertebrate neuroblasts and other stem cells, our findings suggest widespread roles for regulated mRNA stability in stem cell biology.